OSWEGO – Volunteers with the Friends of the Oswego Library will give you a holiday assist throughout December at the River’s End Bookstore. Pictured are Janet Hutcheson of the Friends of the Library board and Bill Reilly of the River’s End Bookstore. 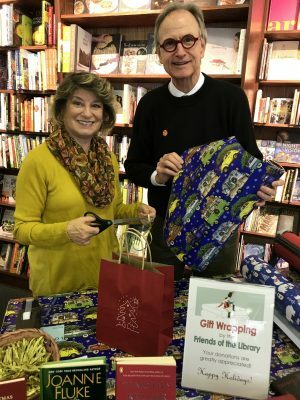 Gift wrapping of purchases at the store will be provided by the Friends on Saturdays and Sundays from noon to 4 p.m. and weekdays from noon to 2 p.m. and 5 to 7 p.m. beginning Dec. 8. Wrapping paper and the wrapping service are provided free of charge, but donations to the Friends of the Library are gratefully accepted.